Read this review and more on my blog October Tune. I love short stories, and I love books that are a compilation of short stories. Last year, around Halloween I read the book Halloween edited by Paula Guran, and this year I decided to read My True Love Gave to Me in December. This book is compiled of twelve short stories all happening around Christmas or New Year's Eve. A lot of well known authors are in this book, including Rainbow Rowell, Stephanie Perkins and Laini Taylor. I am going to review all the stories in separate. I thought this story was adorable. It happens over the course of a couple of years, and during New Year's Eve. The main characters are Mags and Noel and they are best friends. I just thought they were incredibly sweet together and Rainbow just made me love these characters in only twenty-some pages. I just love her writing (Fangirl is still one of my favourite books, and I adored Eleanor and Park), and I thought it was just such a shame that the story ended! This one was a bit odd. It also happens over the course of a couple of years, and always on Christmas Eve; but it was completely different from Rainbow's story. For most of the time I had no idea what was going on, and that ending was just very strange and very abrupt. No, this is a perfect example of a short story that should have been a complete book. This was also a very nice story. It's about Shy (yes that is really his name) who is cat-sitting for his boss in a house that is completely empty of food. Also, he doesn't have any money. So basically, he's starving on Christmas Eve. Then he meets the girl who lives above his boss' apartment and they end up becoming friends. I thought it was such a sweet story and I really wanted to read more about these two characters. It was really such a shame the story ended, a bit abruptly in my opinion, but yeah it was so sweet. And the cat. THE CAT! Hmm, nah I didn't like this one. First of all it just felt a bit odd, and I didn't really like any of the characters. The ending was also so abrupt, and I just didn't like it. That's basically all I've got to say about this story. This story started off with me feeling like it would be a bit supernatural-ish. With a girl celebrating the solstice and wanting someone's voice. It turned out to be a normal contemporary story but I really liked it in the end. Though I am not a fan of insta-love, I did really like these two main characters together. They were adorable, and North was just a really sweet kid (he just had a bit of an unfortunate name). Again, this ended a bit abrupt and I just hoped for a bit more but alas! I believe this was the only story in this book with a gay couple in it, and I really liked it. The fact that this guy was willing to dress up as Santa for his boyfriend's little sister was just adorable. I didn't really make that much notes for this story, but yeah I thought it was nice. Personally, I thought this story was a bit odd. I mean yeah it was nice with the three girls trying to organise a party in a trailer, but the whole goatboy thing was a bit strange. Perhaps I would have liked this story more if it had been a book but it just felt way too weird for a novella. I love Gayle Forman's writing. I fell in love with it after reading Just One Day, and I was really excited when I found out she'd written a story for this book. Though I am still not a fan of insta-love I kind of got over it with this story, because the two characters; Sophie and Russell, were just so awesome. Like with the story by David Levithan, I didn't write down much for this story but I just loved it (hence the 5 stars)! I didn't really feel anything for this story in the beginning, because the main character was a bit of a trouble maker and loved to wreck other people's stuff. But in the end, I really started to like the guy, after he tried to save the play his friend was going to perform in. This story was about a small town called Christmas, where Maria worked as a waitress at the diner. The diner has just gotten a new cook, who seems to know what people want/need to eat before they even order. I really liked this story, because of the cook, Ben. I just liked him right from the start, and he made everyone really happy in that town. This is one of the stories that I would want a sequel off, definitely! In Star of Bethlehem, two girls (one from Iceland, one from America) trade plane tickets so one can go to New York and the other can escape New York instead. We follow the latter to a town called Bethlehem, where she meets the family the Icelandic girl would have gone to and she stays with them for a while. I am not really sure why I liked this story so much, but it's probably just because of that family. They were so nice to the girl hover to read spoiler. and Ethan was so nice as well. The ending was a bit of a surprise to me, but I loved loved LOVED it! I actually didn't read enough of this story to write a good review about it. I didn't like it from the start, it felt a bit weird and then there was a lot of explaning going on before the actual story started. So I just put it down and didn't pick it up again. I am curious for Laini Taylor's books though, but this story just wasn't my cup of tea apparently. 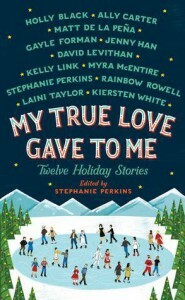 In the end, I really enjoyed My True Love Gave to Me, it had some amazing stories, some not so amazing stories, but it was a very good book. If you want to read some fluffy Christmas stories, you should definitely go and pick up this book!